Fall River, MA – Saint Anne’s Hospital has received the American Heart Association/American Stroke Association’s Get With The Guidelines®-Stroke Gold Plus Quality Achievement Award. The award recognizes the hospital’s commitment to ensuring stroke patients receive the most appropriate treatment according to nationally recognized, research-based guidelines based on the latest scientific evidence. 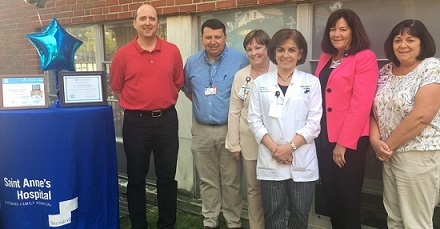 Saint Anne’s, which was designated as a Primary Stroke Service provider by the Massachusetts Department of Public Health in 2005, earned the Gold Plus award by meeting specific quality achievement measures for the diagnosis and treatment of stroke patients. These measures include evaluation of the proper use of medications and other stroke treatments aligned with the most up-to-date, evidence-based guidelines with the goal of speeding recovery and reducing death and disability for stroke patients. The association’s “Target: StrokeSM Honor Roll” award. To qualify for this recognition, hospitals must meet quality measures developed to reduce the time between the patient’s arrival at the hospital and treatment with the clot-buster tissue plasminogen activator, or tPA. tPA is the only drug approved by the U.S. Food and Drug Administration to treat ischemic stroke. The drug must be given with a few hours of the onset of a stroke to be effective in reducing stroke complications. The Massachusetts Paul Coverdell Stroke Program/Hospital Quality Improvement Collaborative’s Dysphagia Screening Award in the large volume category. Dysphagia, also known as difficulty in swallowing, can be one of the effects of stroke. To earn this award, the hospital must complete dysphagia screening on at least 90% of stroke patients before they receive food, liquid, or medication. The Dysphagia Screening Award is a quality-of-care benchmark that captures the percent of stroke patients who undergo screening for this condition. Above: Among those celebrating Saint Anne's Hospital's Stroke System of Care awards at a hospital-wide reception were (left-right) Stroke Committee Chair Dr. Farrel Douglas; Ron Audette, Saint Anne's EMS manager; Erin McGough, of the Stroke Committee; Lisa DeMello, Saint Anne's stroke coordinator; Carole Billington, chief operating officer/chief nursing officer; and Lisa Chagnon, director of the Emergency Department and member of the Stroke Committee. In addition to comprehensive emergency, medical, surgical, and diagnostic services, Saint Anne’s key services include multiple robotic-assisted surgical capabilities; Saint Anne’s Hospital Regional Cancer Center; the Center for Orthopedic Excellence; ambulatory surgery centers in Attleboro and Dartmouth; the Center for Pain Management; and inpatient geriatric psychiatry services.